A lot of people wear sleek, high-tech bracelets on their wrists these days. (A smaller group of people wear less sleek, high-tech, non-removable bracelets on their ankles.) Either way, they’re tracking their steps. Turns out you don’t have to buy a bracelet (or have a judge award you one) to know how many steps you take in a day. All you need is an iPhone 5s or newer, and the right app. From the chart it’s easy to see that I walked a lot on Sunday, but not a lot since. Oopsy. At the top you have two buttons: one on the left for settings, and one on the right for sharing. The Preferences include an option to remove the little ads from the bottom of the screen for a “Generous Tip” of 99¢, a “Massive Tip” of $1.99, or an “Amazing Tip” of $4.99. You can also set your daily step goal, and whether you want to see the current step count on the icon, the same way Mail shows you how many unread messages you have. UPDATE January 18th, 2015: I had to work at it, but I got the celebration on video. Tap or click on the picture below to see it. Pedometer++,* on first launch, will display step data from today, yesterday, and maybe the day before yesterday. That’s because the iPhone’s M7 chip has been recording data all along. You weren’t using that data, but the M7 was recording it. 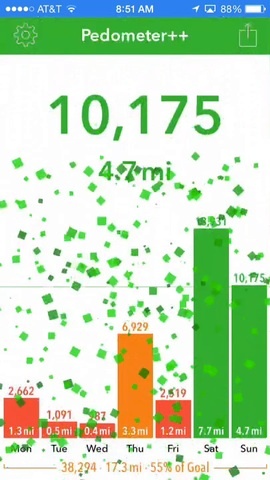 Pedometer++* reads the data that’s already there and displays it. The fact that the data is being gathered whether you choose to view it or not is sort of spooky, at least at first. The good news is, since the data’s being gathered anyway, apps like Pedometer++* don’t have a battery-draining effect. Get Pedometer++,* put your iPhone in your pocket, and start tracking your activity today (or yesterday, or even the day before). Hint: mowing the lawn is a great way to get your steps in. Anyone who wants some extra lawn to mow, please contact me. We have openings twice a week in the summer.